SonicBrite Large Size Powder Refill - 21 oz. 196 Cleanings ON SALE! Need more cleaning powder for your SonicBrite™ system? 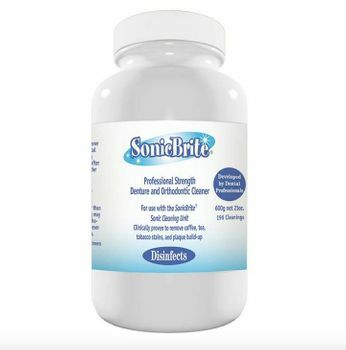 This LARGE Economy-Sized bottle of SonicBrite cleaning powder will last you for more than 6 months if you use the product every day! The Sonic Brite system is a safe yet powerful cleaner for retainers and removable dental appliances such as: plastic and wire Hawley retainers and appliances, mouthguards, nightguards, bruxism appliances, and TMJ splints. This cleaner is gentle enough to get all the thick white build-up off of retainers, leaving them good as new; yet tough enough to clean even the most stubborn coffee and tea stains off of dentures or partials! It helps keep all types of dental appliances bright, clean, and fresh. Each 21-ounce bottle of SonicBrite Professional Strength Cleaner is enough for 196 cleanings. It's an economical and smart way to keep your dental appliance clean and odor-free year-round! The Sonic Brite powder is unflavored and unscented - great for kids and adults alike! Please note that the cleaning powder is specially designed to work with the sonic bath (sold as part of the SonicBrite kit). The powder will not do the same effective job in cleaning your appliance without the vibrations from the sonic bath that comes with the SonicBrite kit! Sonic Brite is not recommended for appliances containing gold, appliances containing metal solder, Invisalign aligners, or clear Essix retainers (can sometimes turn them cloudy). Do not soak appliances containing metal components for more than 15 minutes per cleaning. You get one 21-ounce (200g) bottle of cleaning powder, which is enough for 196 cleanings. SonicBrite is a high-quality dental appliance cleaner which is strong enough for dentures, yet gentle enough for most types of retainers. It is especially good at removing stubborn white plaque buildup after several uses. This large sized bottle (21 ounces) will last you for more than 6 months!